There is no "wrong" method for making crumb blocks. The only rule you need to follow is this: Be sure you have an adequate seam allowance. (just so it doesn't pull apart in use.) Also, spray starch and a hot iron are your friends! They help the blocks to press nice and flat. But, I have been asked how *I* do it. So this picture heavy post will show you. 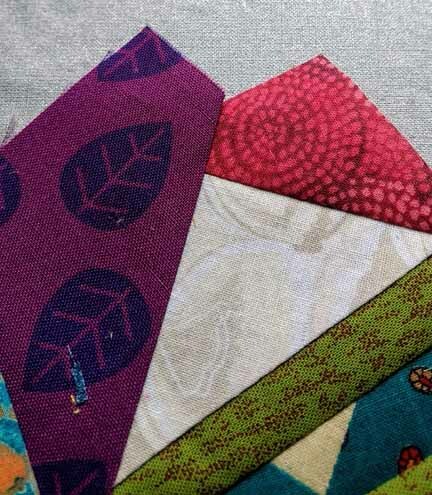 First I start with a pile of scraps and pieces. From the pile I pick a piece to start with. 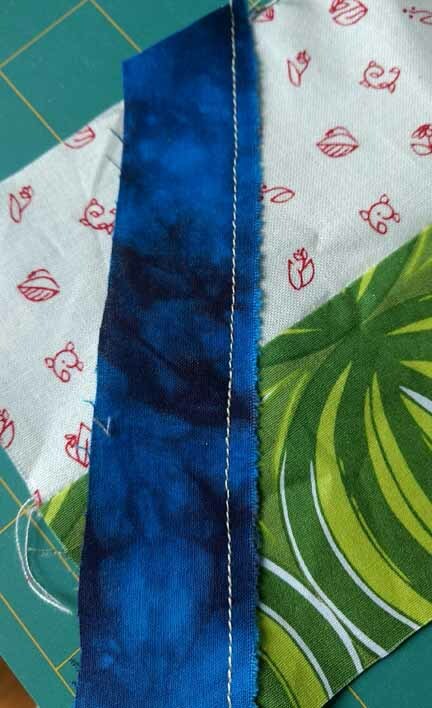 I have a chunk that is two strips already sewn together. So I am going to take a skinny strip that contrasts nicely and sew it across at an angle. I don't really worry about edges being very straight. After it is sewn I trim it off saving the rest for more blocks. Then I press it open. 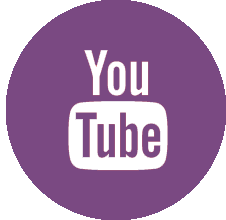 Notice that the blue strip is slightly curved on the bottom? Not to worry. I just keep sewing. I work on at least two blocks at a time so you will see pictures from both of them. Sometimes there is an odd corner that doesn't meet evenly. Again, I lay a piece diagonally across it and sew some more. As long as the edge securely catches the seam there where the two pieces meet, it will be fine. 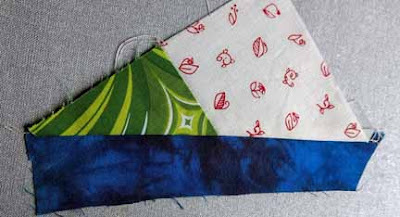 After sewing, I cut off those triangle pieces and put them back in the scrap pile. Sometimes, if they are really small they go in the bin. 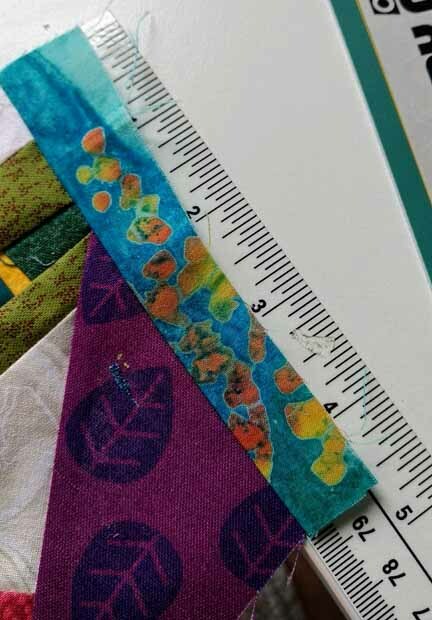 Occasionally I will check the size to see if I need to extend an edge. This one was less than 5 inches. 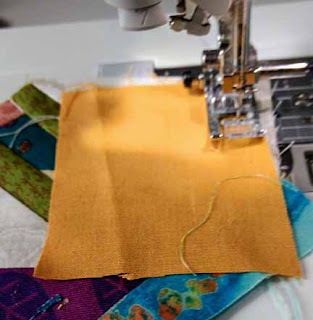 That means - sew a piece on one of the edges. Some of the extender will be trimmed away - but unless that piece is small - it goes back in the scrap pile. Finally I arrive at a piece that is large enough to trim into my 5 inch block. The ruler on the block lets me be sure it is big enough. I put my finger at the 5" corner and then look at every edge. 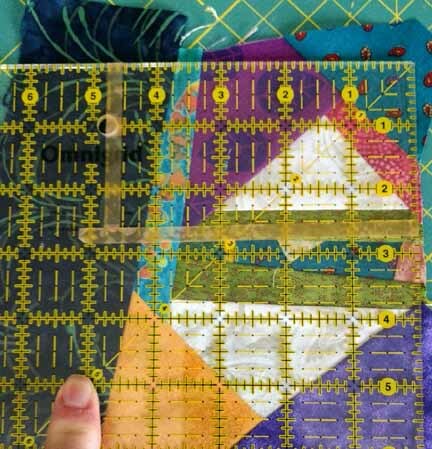 I also move the ruler to try for the most visually interesting block. You can see that I am trimming away pieced parts as well as a piece of the dark fabric. Don't worry- that goes in another block. 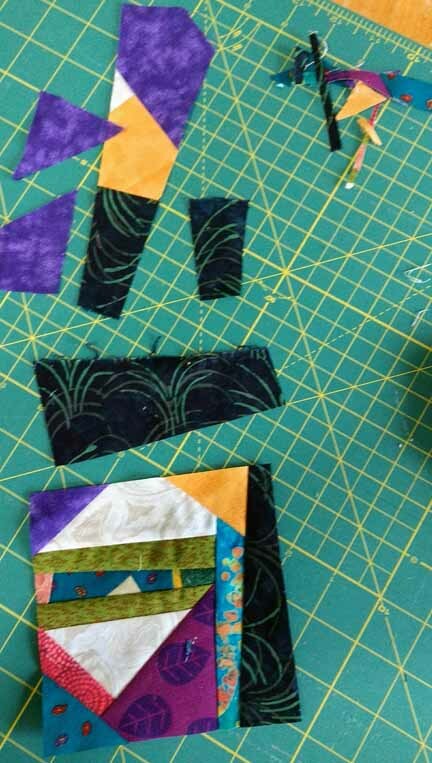 Once trimmed, I have a few small trash scraps - AND five usable pieces in addition to my block. You can see that the pieced part of the other block became part of the bear block - and the part that is trimmed away will be part of yet another block. 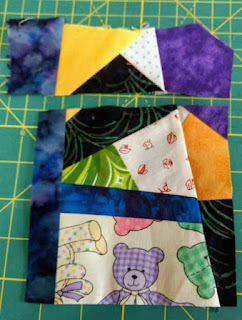 If you have orphan blocks, you can do the "sew a strip across" trick and change them up to make them less recognizable. 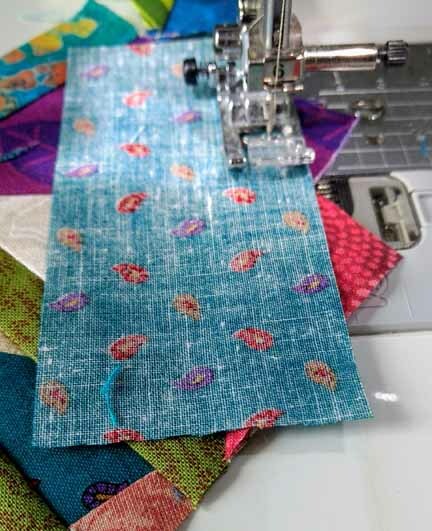 Doing that speeds up the crumb block process and really can add pizzazz and sparkle to your scrappy wonderful quilt. PS - you can do these in ANY size you want. So try it and have some fun. 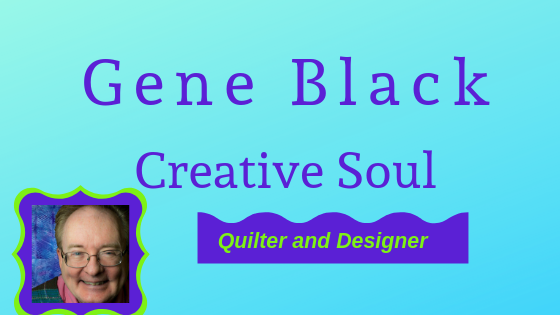 And visit A Left-Handed Quilter to read about The Crumb Block Challenge. Another late addition to this post: For Spray starch, I use a homemade formula that is roughly 3oz of the cheapest vodka you can buy -- this time cheaper is better, I use Aristocrat brand. Approx 24 ounces of distilled water is added to the 3 oz of vodka. That is all you really need, but I add several drops of essential oil for fragrance. I like cinnamon, but lemon, peppermint, lavender or some other essential oil will work as well. Start with a few drops - you can add more but you don't want it to be overwhelming. This works like a certain other starch alternative that is very popular with quilters. Excellent tutorial, Gene. I love that there aren't a lot of rules for making crumb blocks and I can see this being a wonderful leader-ender project. Great tutorial Gene! I was afraid that without the foundation papers my blocks would be all wonky and wouldn't lay flat, but yours lay flat and look very nice. Thank you for sharing. Reminds me of paper piecing. 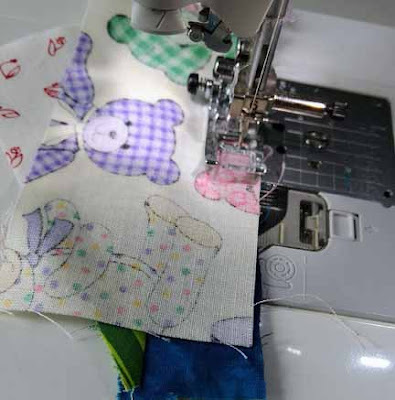 Do you iron after adding each strip like in paper piecing, or just before trimming? Thanks for sharing how you do it. I was going to comment and ask, so I guess you are a mind reader too! Thanks for this, Gene! Jen said it reminds her of paper-piecing. 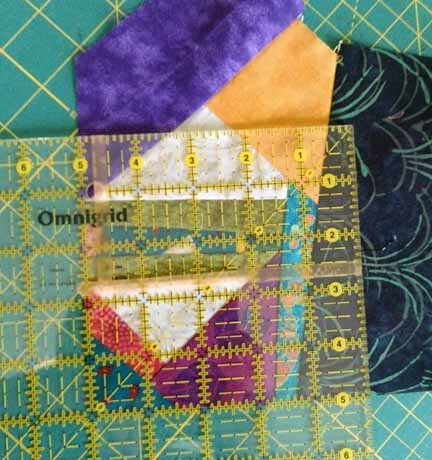 I’m paper-piecing now, so I should be able to do this. Don’t know though, I’ve tried and failed miserably. I will try it with your tutorial by my side. 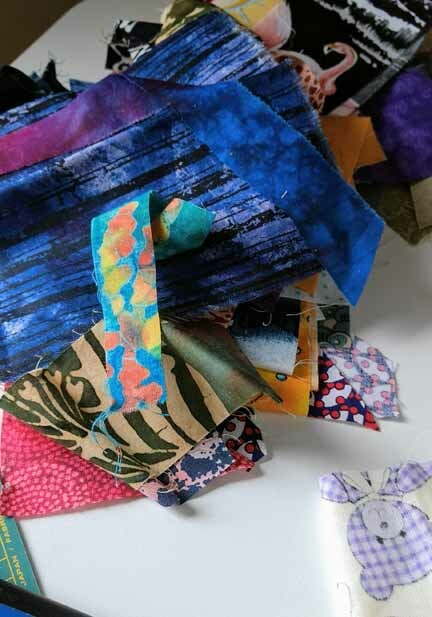 Paper-piecing has provided me with many scraps. What is the difference between your “scrap pile” and “bin”?